Gu is one of my favourite makes for desserts, one I associate with luxury. I know their dessert range well, and when I saw a new variety it was inevitable I'd pick a pack up. As someone who is a big fan of nuts the word praline in the title was a complete bonus too. There are two tartlets in the box and they look neatly designed with two thin lines of light icing for decoration. Packaging was minimal in that it was just card board, sealed in the middle. This is probably more environmentally friendly but it did feel a bit unsafe. Like if you put them in the fridge near the onions they might absorb the aroma. I didn't for the record, it was just a thought I'd had. Perhaps I've become too used to the over packaging we normally get these days. I a cut a chunk out of the tartlet and gave it a taste test. I have to admit to finding it a bit dull. Perhaps the pastry was a little thick, and not well flavoured. There was a strange crunchy section in the middle too, that didn't taste of very much. The layers of filling weren't a strong taste either, just very mild nuts and I couldn't distinguish between them. It's the first Gu pudding I've become bored of, despite usually loving nutty flavours (literally and metaphorically). 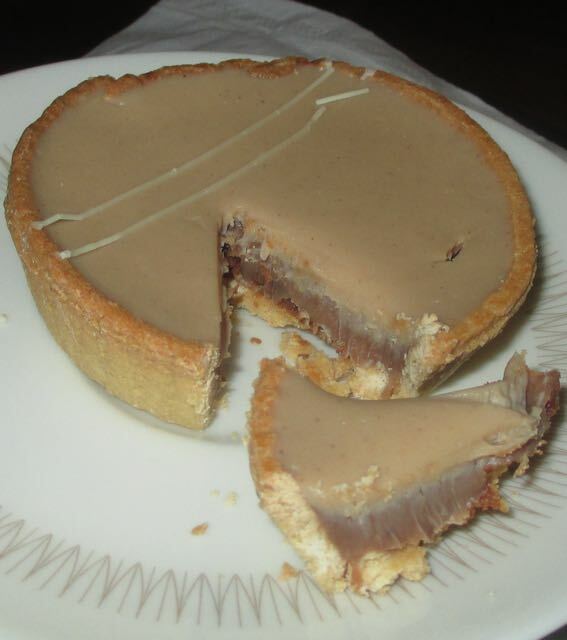 At 487 calories per tart I had been expecting something a bit more. I have to confess to giving up on it and wishing I'd picked up a box of their Key Lime Pies instead, well at least I know what I'm buying next time.